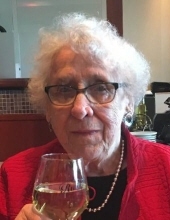 Regina (Jean) Zazecki, 94, of Garwood, passed away peacefully in her home on Thursday, January 31. Jean was born in Shenandoah, P.A. and relocated at age 16 to join her two older sisters in Bayonne, N.J. She worked at the Maidenform factory in Bayonne until she met and married her husband at age 39. Jean was a homemaker for most of her life and raised her two daughters to be strong, independent women. Jean loved reading the newspaper and was an avid follower of current events. She loved sweets, tea, and carried her purse everywhere she went. She was a tough, simple woman with great taste. Jean had a great run and her health was good up until the very recent months. She is survived by two daughters, Liz Spiridigliozzi and her husband Alberto of Scotch Plains; Diane Kuhtik and her husband Andrew of Garwood; and four grandchildren Peter and Allison; and Andrew and Alexander. She is also survived by two sisters Patricia Cieslukowski and Margaret Tomchick; both of Shenandoah P.A. ; and many nieces and nephews. She was predeceased by her husband Peter; her parents Peter and Rose; as well as sisters Agnes, Martha, Rose, Alberta, Elizabeth, Leona, and Mildred. Visitation will be Sunday, February 3 from 2:00 – 6:00pm at Dooley Funeral Home, 218 North Avenue West, Cranford. A funeral mass will be held on Monday, February 4 at 10am at the Church of Saint Anne, 325 2nd Avenue, Garwood. Interment will follow at Fairview Cemetery, Westfield. In lieu of flowers, contributions in Jean’s memory can be made to Center for Hope Hospice & Palliative Care, 1900 Raritan Road, Scotch Plains, N.J. 07076. To send flowers or a remembrance gift to the family of Regina Zazecki, please visit our Tribute Store. "Email Address" would like to share the life celebration of Regina Zazecki. Click on the "link" to go to share a favorite memory or leave a condolence message for the family.